Another milestone, baby girl is 10 months old today! I am having trouble getting my head around the fact that my baby is going to be a year old in two months. Not just for the fact that the days whiz by but also because she is in such a different place then her brother was at this age, so she seems much younger to me. She is content to just be held and although her fine motor skills, her sleeping and eating habits and her use of language are developing on track, her gross motor skills seem behind. 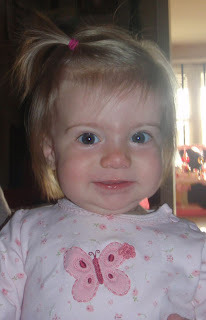 Fussypants was walking at 10 months and had several teeth. Our baby butterfly is toothless, although she is working quite hard to get those chompers to break through. She isn’t crawling, won’t get herself into a sitting position from a lying down one, doesn’t pull herself up and until recently wasn’t really aware that she even had legs. The jumperoo changed that. This past week she began to execute what we call the inch worm. I don’t have video of it yet but she puts her bumbum in the air and scootches forward on her belly, to get where she wants to go. At times, she ends up stuck in a contorted yoga-ish pose and at other times the slowness of it frustrates her but she’s moving. And the temptation of her brother’s toys got her to try to pull herself up yesterday (but mostly she succeeded in just headbutting the couch). All babies are unique and meet milestones at their own pace. Developmental guidelines simply show what your baby has the potential to accomplish — if not right now, then soon. I get it that you are not suppose to compare your kids and I understand that there are ranges with each month/milestone for a reason but having one child off the charts ahead of the curve and one on the other end of the spectrum is challenging for this mama. Not because I have a need to brag that my child can do everything nor am I worried that she isn’t where she needs to be (she is) but with an active household, I find myself in the quandary of wanting her to catch up with the rest of us, but at the same time stay my baby a little longer. Our little family of four is it, we are done breeding, and a big part of me really wants my last baby to stay a baby. But then when we are out and about, and she is being crabby-cakes because she’s stuck in the baby bjorn or the stroller, another part of me wants her to be up cruising so she can join the fun. Thus I am learning to take it day by day, enjoying what is and not worrying about what isn’t. All babies are unique, all babies develop at their own pace and every day is a gift. And sometimes you get really funny video of it. I know you know this… it's so easy to get caught up in where the books (Websites) say your children should be, but as long as she's happy and developing in ways that your pediatrician considers "normal" there's nothing to worry about. I can't believe she's going to be one year old in two months either!! Before you know it, she'll walking and talking up a storm. Enjoy the baby! Thanks Tonya. It's hard not to get caught up in all that, especially since I read WAY too much and tend to self-diagnose (there is so much info out there it's hard not to do that) but she is happy and just fine so life is good. Such a sweet little cherub! When Mason was small, he was very developmentally delayed in a lot of areas and he remained that way through the late twos… I was in and out of specialists offices and they looked at me like I was a total nut bag… Today he is a thriving 7 year old…time does fly! The important thing for me was to be his best advocate…If I perceived a problem then I made it everyones problem…Since he is an only child I think they thought I just did not know as he was my first and only… So I say while everyone may develop on their own schedule, late bloomers, early bloomers what have you…. The mamas know! We are generally always right…I got early intervention and it helped and it eased my mind.. She is doll! You are the best mama…deep breathing and lamaze are for what happens post partum… LOL!